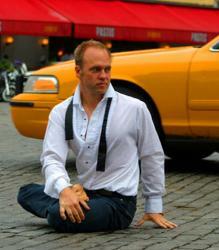 Edward Vilga, creator of Yoga in Bed and Yoga for Suits. If you think a consistent yoga practice is hard to manage, Yoga for Suits and Yoga in Bed by Edward Vilga will completely change your mind. Vilga understands a little about time management. As a yoga instructor, popular speaker, writer, director, and visual artist, his philosophy about maintaining a yoga practice is to integrate it into your life in myriad ways. LoveToKnow Yoga asked Vilga to share his views on finding time for yourself. He shows us how any moment, even playing with your dog, can be a yoga moment. Please tell us about your personal yoga journey. It seems like yoga has always been a part of my life. I began reading yoga texts at a really early age. I still have my original, $1.95 paperback copy of Vishnu-devananda's book, now in complete tatters. That book and others gave me an introduction to yoga philosophy and a sense of the poses. This, combined with having been raised Catholic, wove a profound sense of spirituality and philosophy into my life. I have often joked that I am "an altar boy gone wrong"-or gone perhaps gone "right"-it all depends on your perspective. I have a parallel career as an artist-I am a writer/director of films and theater, and also a published author-and although these works are quite diverse, nonetheless themes of transformation often run through my creations. For example, my feature film debut, Dead Broke, plays with the theme of karmic obligations, specifically what people feel they owe each other. Only in my early 30s did I begin to dabble in public yoga classes. Although I was pretty athletic, it wasn't the physical practice so much that had hooked me, but the ideas and perhaps, more accurately, the feelings that yoga aroused in me. However, during a very intense and difficult period, I stumbled into a yoga class at my gym and found myself hooked for the first time on the physical practice. I had, in fact, always been able to do a headstand or run through the motions of a Sun Salute, but this was different. I think I was ready for not only a more intense, informative, physical practice, but also a sense of community and sharing of devotion. This was not only appealing, but also vital to me. Just when major areas of my life looked their bleakest, I found tremendous sustenance, challenge, and perhaps most importantly contentment in class. The yoga program at Crunch, my gym at that time, was created by Dana Flynn, an amazing teacher who, with her equally awesome partner Jasmine Tarkeshi, founded the Laughing Lotus. I was immediately drawn to their vibe of very serious, challenging yoga with an undiluted spirituality and tremendous sense of playfulness and fun. I began my teacher training with Dana and Jasmine at the tail end of this difficult period, less because I was thinking of a career re-direction and more as a way of intensifying my personal practice. Interestingly, the skills I developed as a director lent themselves well to teaching. There are many parallels between working with actors, for example, to bring them to another emotional level to creating a class that transports people (one hopes) to a more peaceful plane. Once I started teaching, I plunged in, and now have a thriving private practice in New York City and teach at the Laughing Lotus as well. The feeling there-and the permission to be oneself-is unique. You stress that, "Consistency is the most important factor in yoga." Why do think, no matter how good yoga makes them feel, many people find it difficult to keep up it with regularly? It's the age old question: why do we know something is good for us-perhaps even really enjoy it-but often stick with the less empowering choice? Intimidation. Often people feel intimidated to even start yoga. 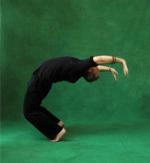 There are so many images that show the beauty of yoga through difficult asanas and virtuoso poses. I thrive on a challenging practice and personally find these images inspirational, but more often than not 99 percent of the population looks at them and thinks, "I could never do that." I've tried to create yoga books and DVDs that are essentially for everyone. When the DVD played on an endless loop at a major national health conference, the comment I heard the most was, "Wow…I could do that." This pleases me, because I'm interested in sharing yoga in a way that's inclusive, rather than impressive. Time. There are a lot of preconceptions about how much time one must budget for exercise and/or meditation. Of course, I'm not disputing that there's data to suggest that aerobics must be sustained for a certain amount of time to produce specific results. However, rather than set an arbitrary 20 minutes of meditation in the morning, why not have three minutes over your coffee cup? I'm serious. Given the demands of family life, scheduling, car pools, morning meetings, and so on, you might not be able to budget long periods for meditation or yoga. Rather than waiting until you can carve out that perfect window, which, by the way, never happens, no matter how good the intention, I think it's far better to meditate for three minutes every morning. Organic. People think that they have to purchase a lot of equipment, or change outfits, or travel to a yoga center or a gym to do yoga. That's why I created Yoga in Bed and Yoga for Suits. Yoga in Bed has two twelve-minute routines for morning and evening that one can flow through with total ease. Yoga for Suits contains a lot of simple stretches, moves, and breathing exercises that can be woven into the day, at your desk, without interrupting the flow. You certainly have created a gateway to "no excuses!" yoga with these materials. Tell us how you developed the routines. I created these because of the demands of my own life. There's that old saying, "the cobbler's children have no shoes." Well, ironically, when I switched over to teaching full-time, there was an intense period where I taught everywhere and anyone I could. I was running myself ragged, and frankly, didn't have a second to take classes. I found myself churning in bed each morning, slapping the snooze alarm, and doing a few simple stretches. Dana Flynn and I were discussing book ideas, and when she suggested Yoga in Bed, I knew she was on to something. I also realized that a super-gentle form of yoga was realistic and attainable for most people. My schedule calmed down a bit, and I was able to resume my own intense practice, but I thought that if even I-a yoga teacher-had trouble finding time to take class, certainly other people did as well. Yoga for Suits grew from the success of Yoga in Bed. I realized that the workplace needed both the physical openness of yoga, but perhaps even more a "hit of serenity" during the day. With stress on the rise, and a simultaneous growing openness towards wellness in corporate culture, the time seemed right for branching out. What other yoga projects and/or events are you planning? We're going to expand the series, targeting different groups, such as seniors, kids, and so on. A friendly, accessible yoga practice with a "real world" approach-no practicing on mountaintops for me! I mean, that's very beautiful, and I love doing yoga in natural settings…but for 99 percent of the population, that's not where yoga needs to occur! I'm also finishing a novel with a strong yoga element incorporated in it. The classes you teach at Laughing Lotus are Vinyasa yoga. What do you like about this yoga style? For me, Vinyasa is the most interesting because I love the flowing nature of it. I also love the creativity and that it's never the same. On a personal level, the rhythms of Vinyasa work well for my body. I find myself getting warm and opening up, and I also thrive on the held and sustained moments as well. I enjoy other styles, but it's this sense of flow and connection of body and breath that really feels right for me and my body. Privately, I teach exactly what I feel best serves the student. This varies considerably. What continues to surprise you about your personal yoga practice? Frankly, almost everything. On a physical level, just when I think something is getting stale, I might let myself linger and explore a pose little longer. Often another teacher will phrase something in a way that casts a new light on something I put on autopilot. Sometimes, the inspiration is almost oblique but incredibly illuminating: the right poem or music that inspires something in the movement and breath. I've allowed greater freedom in my personal practice. It looks very different on different days. Sometimes it looks like a traditional yoga class; other times I'm not sure what you'd call it, like when I'm rolling around on the floor, fighting off my chocolate lab's exuberant licking! Mostly, though, I've been focused on connecting time on the mat with time off the mat. There's not much good to an advanced practice if it doesn't help the rest of your life rise to the challenge. Vilga teaches a class in Times Square. How do your students motivate you? My students motivate me constantly. As a private teacher, you work one-to-one and try to really accomplish something specific with someone. There's something exciting about co-creating a journey from one point to another with a student. I'm not sure if my students in class know how grateful I am to them. Often if I'm feeling sluggish and lazy, it's the joyful responsibility of being able to teach a group of eager students eager to learn that gets me on the mat. Their presence and their receptivity are the spark that allows me to fuel my own practice so I can share something authentic with them. What healthful living tips would you like to pass along? Repeat to yourself as often as you can "I am where I am." It's only once you really accept that truth that you can enjoy the feeling of release. Then everything else starts to flow. This renaissance man has a lot to offer art and yoga enthusiasts alike. Get the Yoga in Bed DVD! Visit his website to review his schedule at the Laughing Lotus, private instruction opportunities in New York City, and speaking engagements. The author of this article received promotional discs of "Yoga for Suits" and "Yoga in Bed" to complete this interview.